In 1997, a bronze statue of Duke Ellington, legendary jazz musician and composer, was installed at Duke Ellington circle, near the northeast corner of Central Park. 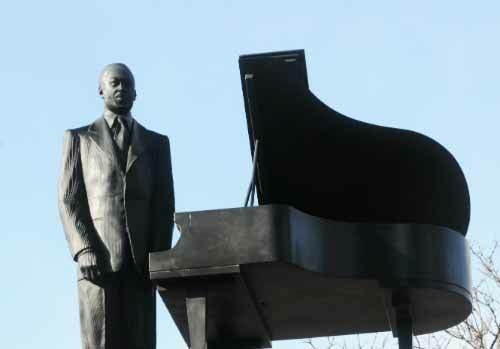 The dedication marked the culmination of an 18-year campaign to build a memorial to Ellington in New York City. In 1979, pianist Bobby Short conceived of the project, began fundraising, and selected Robert Graham as its sculptor. Next came the more difficult question of where to place the statue. One early proposal was to erect the statue where Duke Ellington Boulevard (West 106th Street) entered Central Park. However, the Central Park Conservancy suggested that the memorial be placed near the Park’s northeast corner as part of a revitalization effort of the Park’s northern end. In placing the statue at the Park’s entrance, Ellington joined Christopher Columbus and General William Tecumseh Sherman as the historic figures honored at the Park’s grand entrance plazas. Sixth Avenue/Lenox Avenue was co-named Malcolm X Boulevard in 1987. Seventh Avenue north of Central Park was renamed Adam Clayton Powell, Jr. Boulevard in 1974. The traffic circle at the Park’s northwest corner at 110th Street and Eighth Avenue was renamed Frederick Douglass Circle in 1950 and the section of Eighth Avenue north of Central Park was renamed Frederick Douglass Boulevard in 1977. A statue of Douglass was installed in Frederick Douglass Circle in 2010. 110th Street and Fifth Avenue.